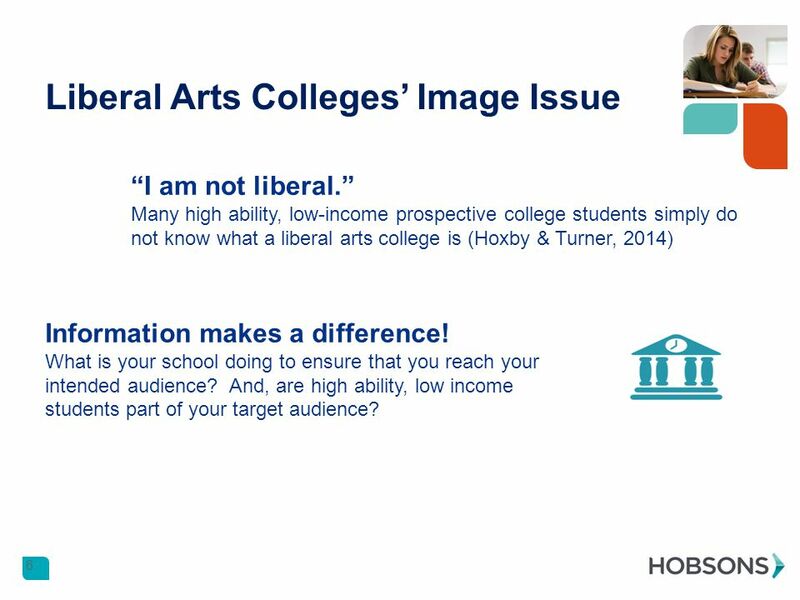 6 Liberal Arts Colleges’ Image Issue 6 “I am not liberal.” Many high ability, low-income prospective college students simply do not know what a liberal arts college is (Hoxby & Turner, 2014) Information makes a difference! 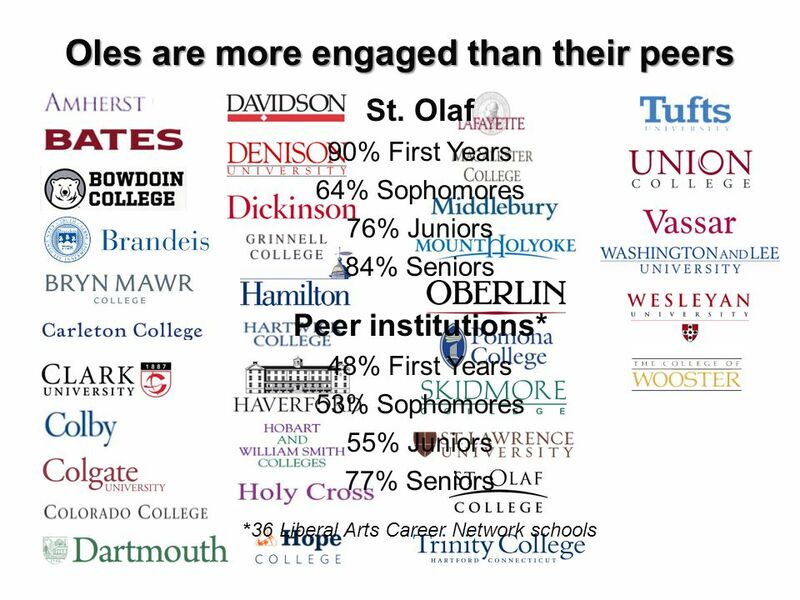 What is your school doing to ensure that you reach your intended audience? And, are high ability, low income students part of your target audience? 7 Can people have too much choice? 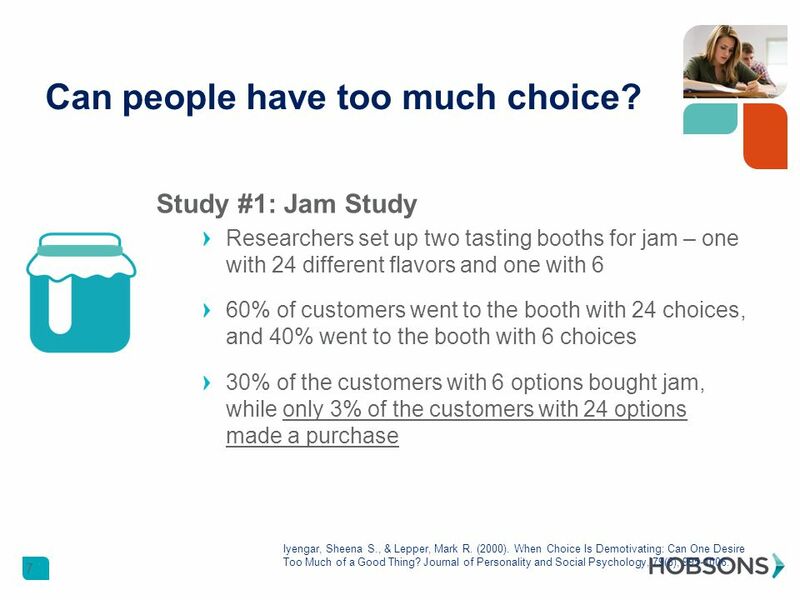 Study #1: Jam Study Researchers set up two tasting booths for jam – one with 24 different flavors and one with 6 60% of customers went to the booth with 24 choices, and 40% went to the booth with 6 choices 30% of the customers with 6 options bought jam, while only 3% of the customers with 24 options made a purchase 7 Iyengar, Sheena S., & Lepper, Mark R. (2000). When Choice Is Demotivating: Can One Desire Too Much of a Good Thing? Journal of Personality and Social Psychology, 79(6), 995-1006. 8 Can people have too much choice? Study #2: Essay Study Students in an introductory college-level course were given the option of writing an extra credit essay. Half the students were given a list of 30 possible topics, the other half a list of 6. Students with the list of 6 topics were more likely to write the essay than the group given the list of 30. 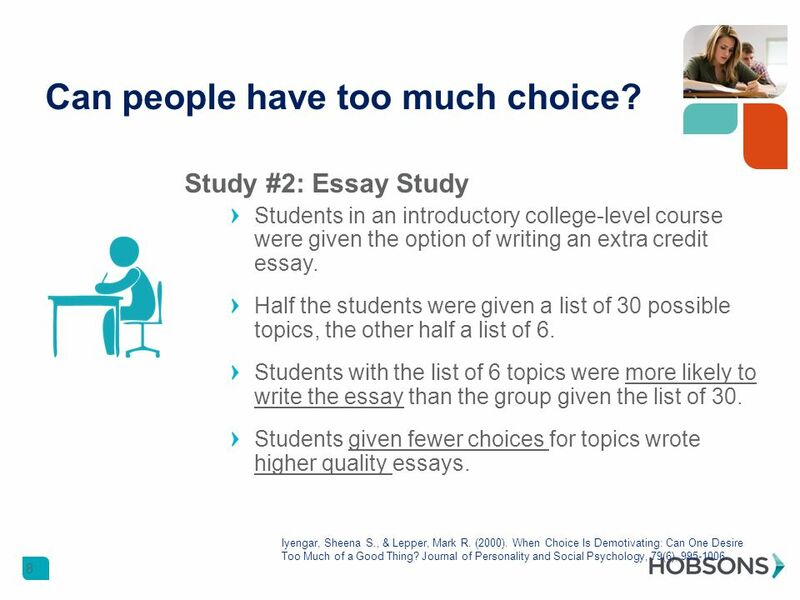 Students given fewer choices for topics wrote higher quality essays. 8 Iyengar, Sheena S., & Lepper, Mark R. (2000). When Choice Is Demotivating: Can One Desire Too Much of a Good Thing? Journal of Personality and Social Psychology, 79(6), 995-1006. 9 Can people have too much choice? Conclusions Having extensive choices in a trivial context can be de-motivating (perhaps even more so in the context of significant decisions). 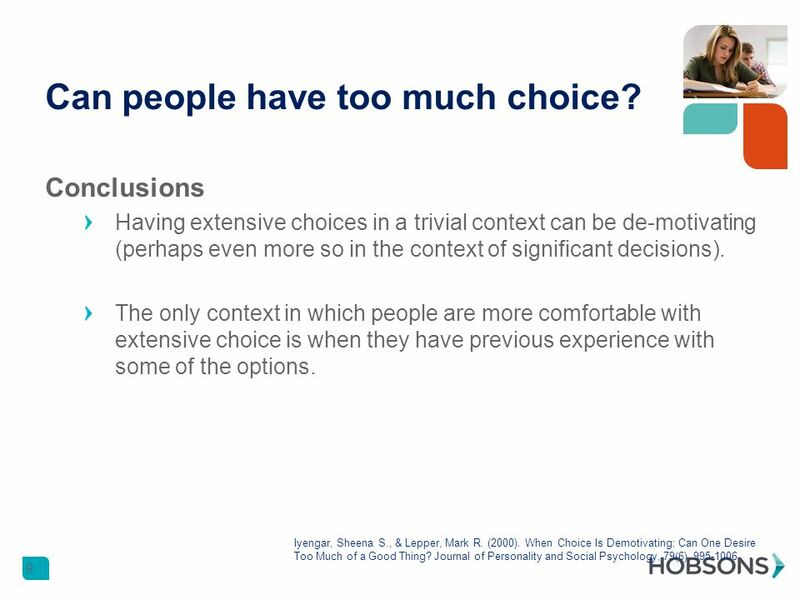 The only context in which people are more comfortable with extensive choice is when they have previous experience with some of the options. 9 Iyengar, Sheena S., & Lepper, Mark R. (2000). When Choice Is Demotivating: Can One Desire Too Much of a Good Thing? Journal of Personality and Social Psychology, 79(6), 995-1006. 11 But what REALLY matters to life after college? 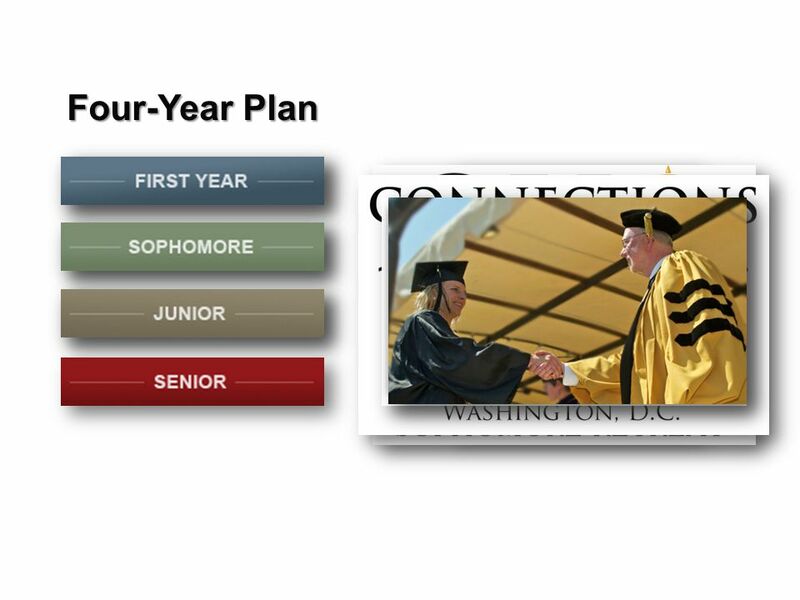 11 http://products.gallup.com/168857/gallup-purdue-index-inaugural-national-report.aspx Gallup-Purdue Index: It’s not where you attend, but rather what and how you experience postsecondary education that matters. Odds of being engaged at work (for a college graduate)… 2.6x Higher if... [College] prepared me well for life outside of college 2.2x Higher if... I had a mentor who encouraged me to pursue my goals and dreams. 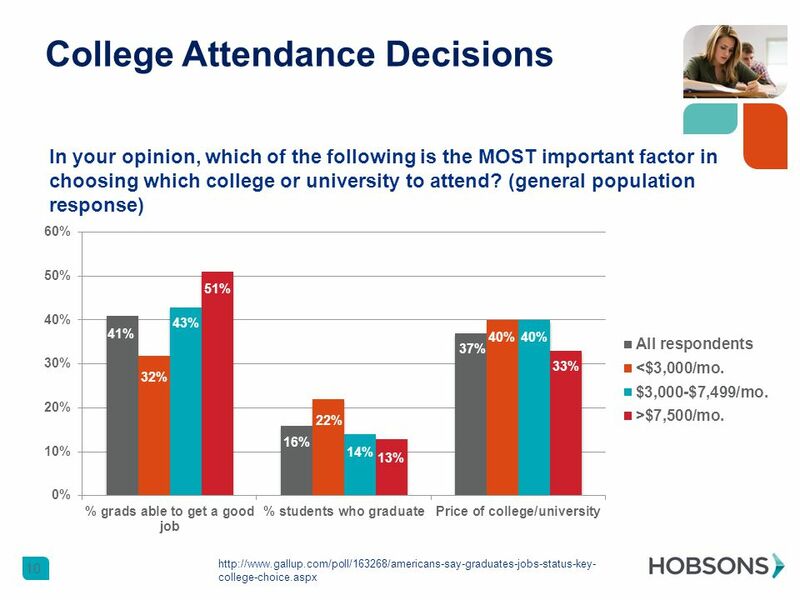 1.9x Higher if... My professors at [College] cared about me as a person. 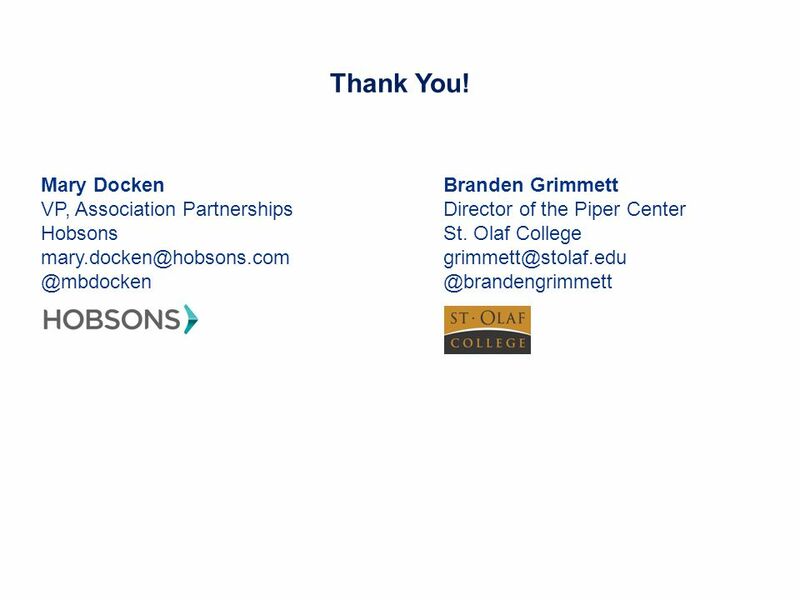 2.4x Higher if... [College] passionate about the long-term success of its student 2x Higher if... I had an internship or job that allowed me to apply what I was learning in the classroom. 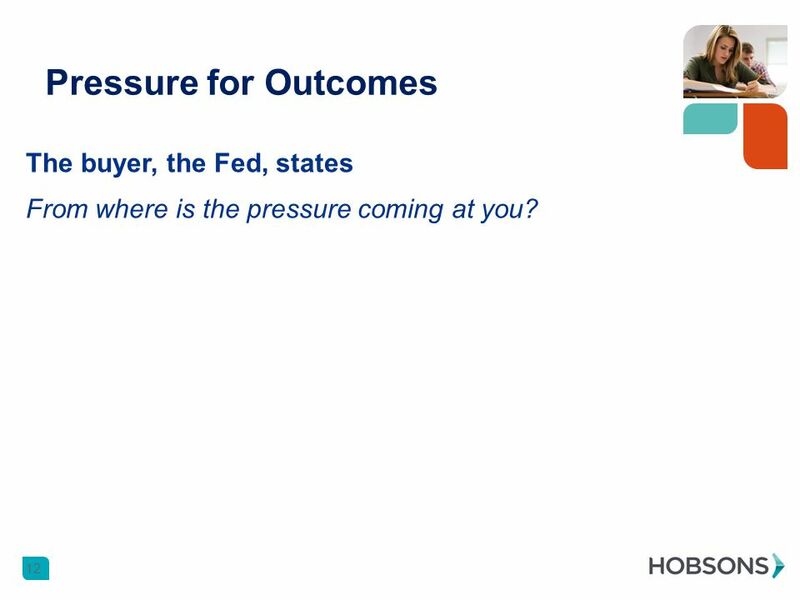 12 Pressure for Outcomes 12 The buyer, the Fed, states From where is the pressure coming at you? 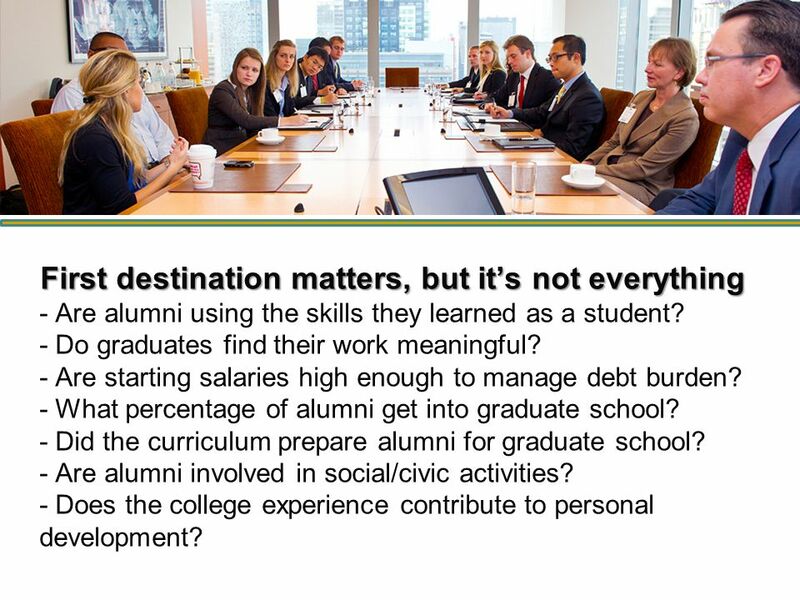 25 First destination matters, but it’s not everything First destination matters, but it’s not everything - Are alumni using the skills they learned as a student? - Do graduates find their work meaningful? - Are starting salaries high enough to manage debt burden? 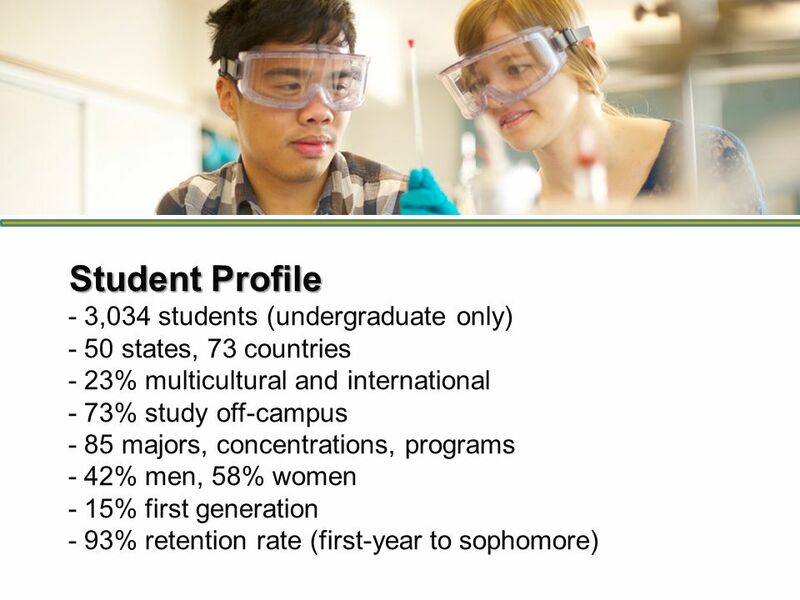 - What percentage of alumni get into graduate school? - Did the curriculum prepare alumni for graduate school? 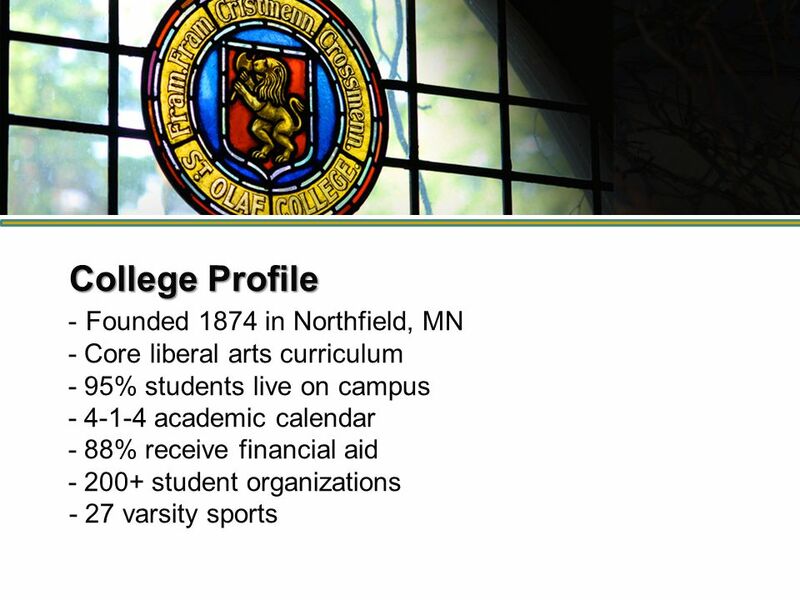 - Are alumni involved in social/civic activities? 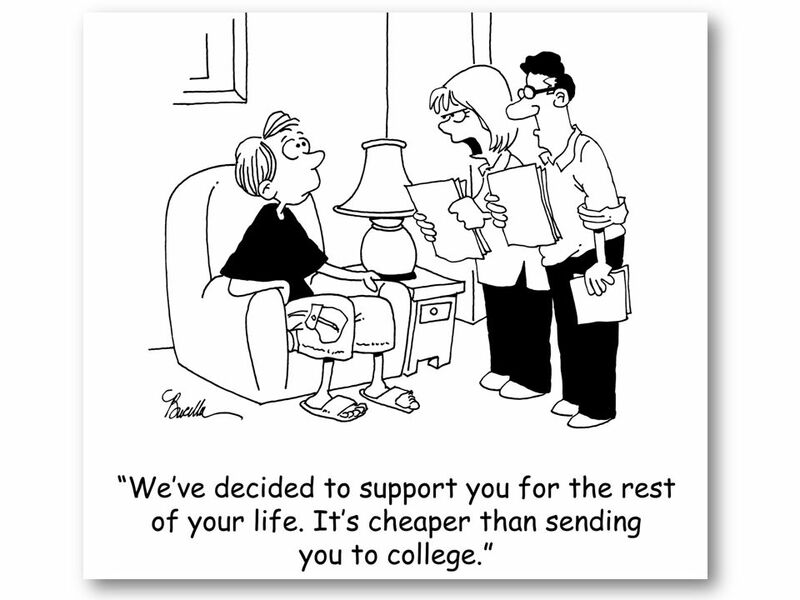 - Does the college experience contribute to personal development? 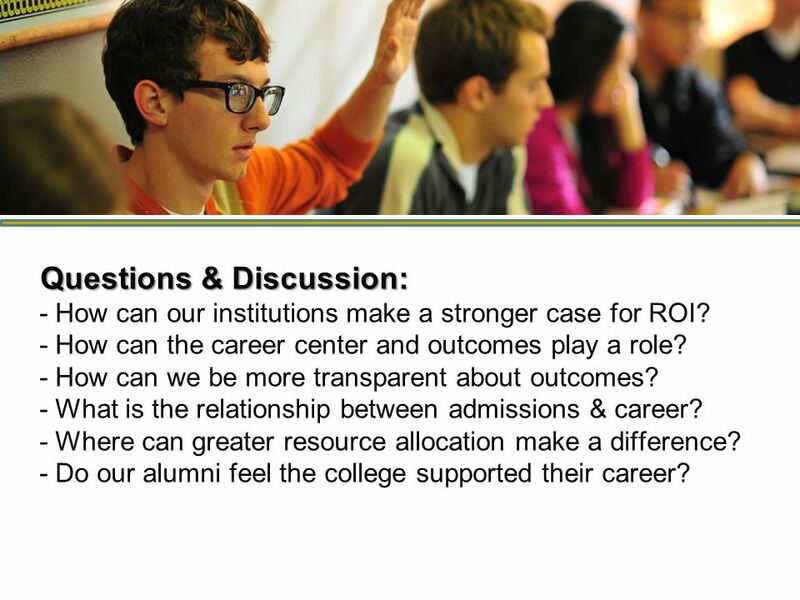 29 Questions & Discussion: Questions & Discussion: - How can our institutions make a stronger case for ROI? 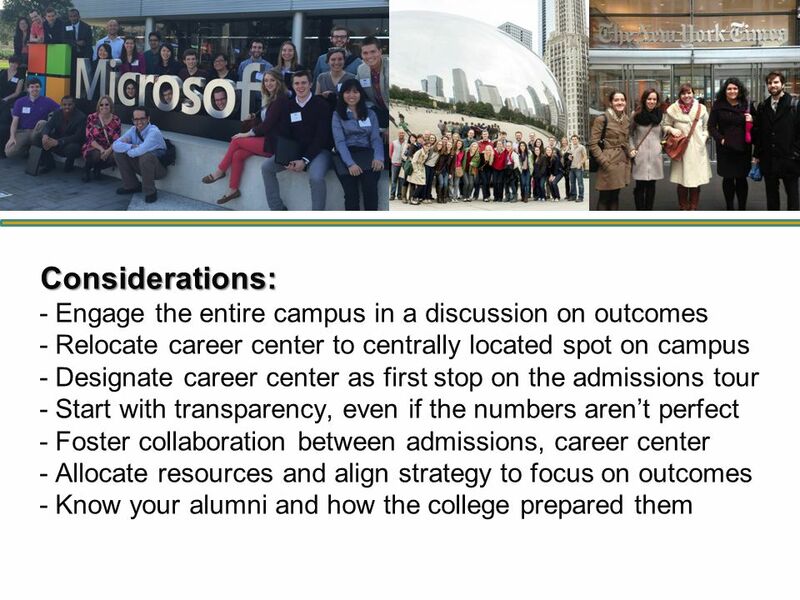 - How can the career center and outcomes play a role? 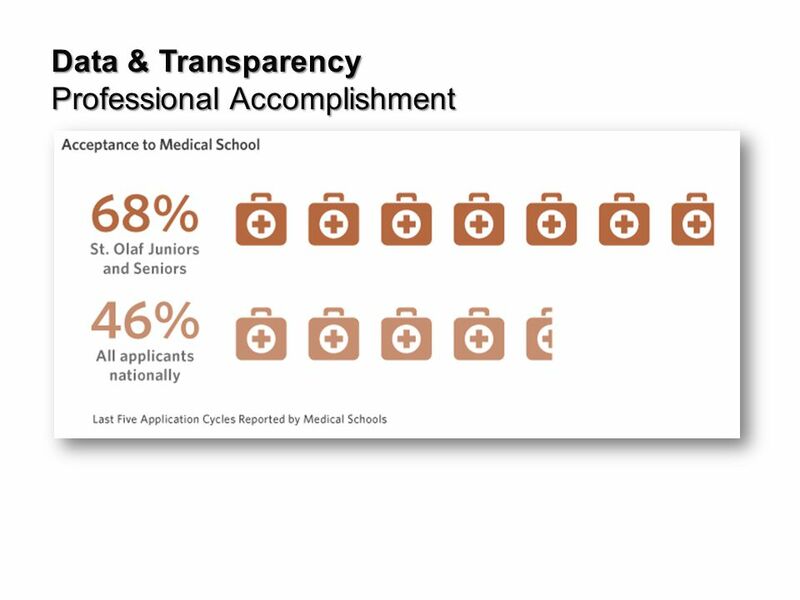 - How can we be more transparent about outcomes? 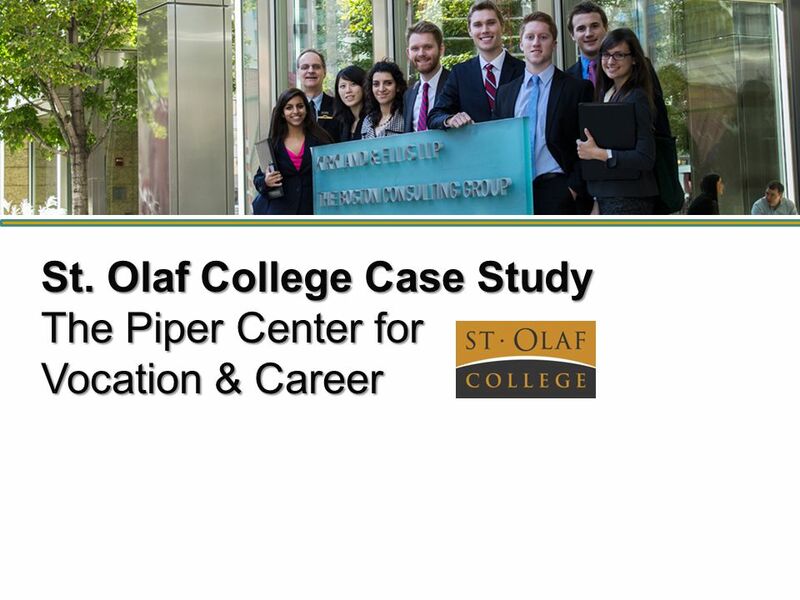 - What is the relationship between admissions & career? - Where can greater resource allocation make a difference? - Do our alumni feel the college supported their career? 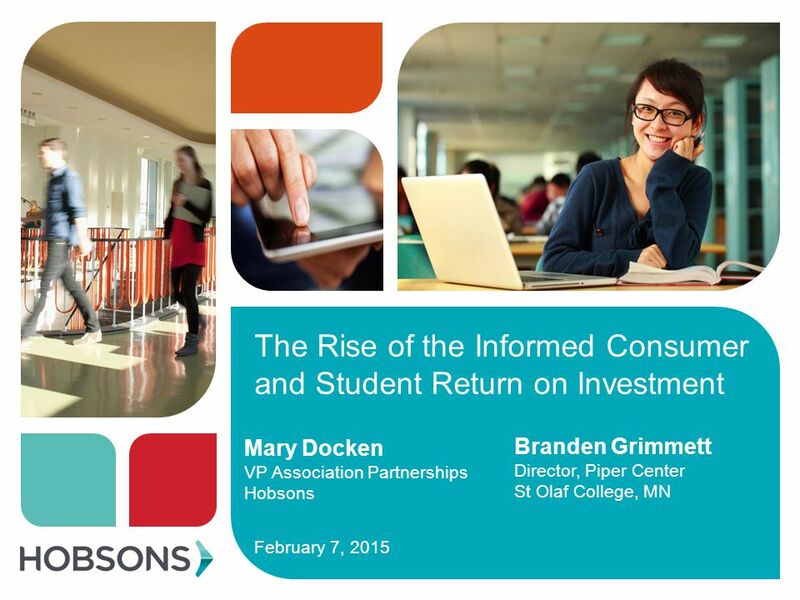 Download ppt "The Rise of the Informed Consumer and Student Return on Investment February 7, 2015 Mary Docken VP Association Partnerships Hobsons Branden Grimmett Director,"
International Students: Best Practices for Recruitment, Admission, and Retention ACCU Annual Meeting Washington, D.C. February 2013. STUDENT SUCCESS CENTERS : WORKING BETTER TOGETHER TO ENSURE STUDENT SUCCESS. How to Help Your Son’s or Daughter’s Career Development ~ What Role Can You Play? 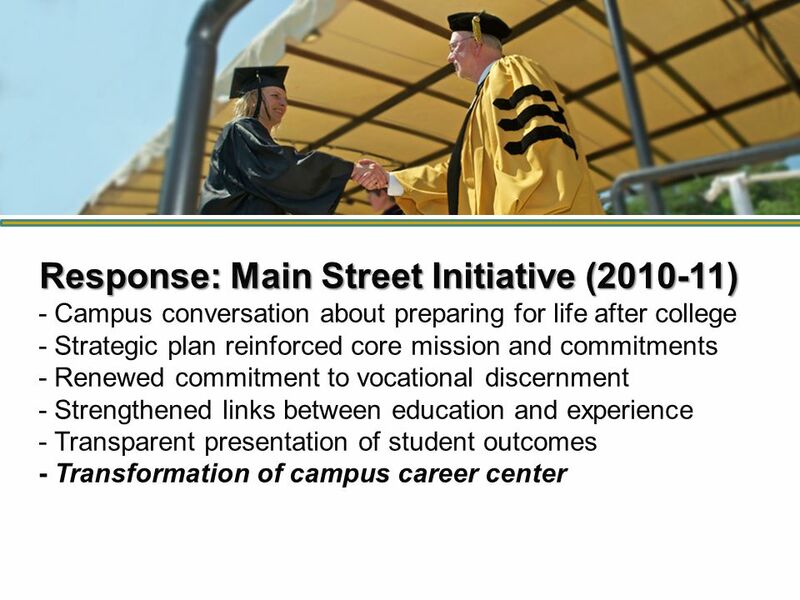 Presented by Career Services, University of Colorado at Boulder. Northern Convening Butte College April 26, 2013 College Team Facilitators’ Presentation Student Support (Re)defined. Branding & Integrated Marketing Future Is Now Forum Annapolis, MD By George Dehne GDA Integrated Services. #IsGradSchool4Me Presented by Texas Iota Chapter Texas State University Alpha Chi National Convention 2014. MELMAC Community Self-Assessment Peer Learning Session MELMAC EDUCATION FOUNDATION. 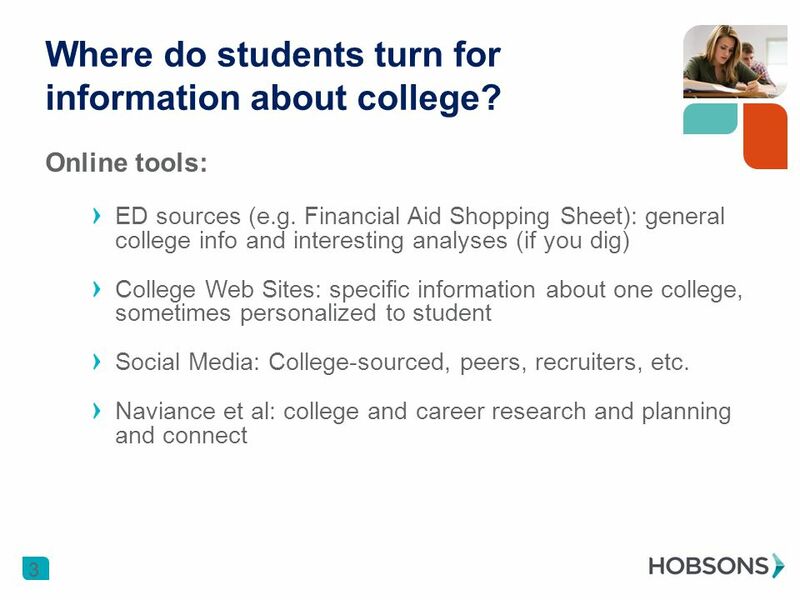 Illinois High School to College Success Report High School Feedback Reporting In Cooperation with ACT, Inc. Illinois Community College Board Illinois Board. 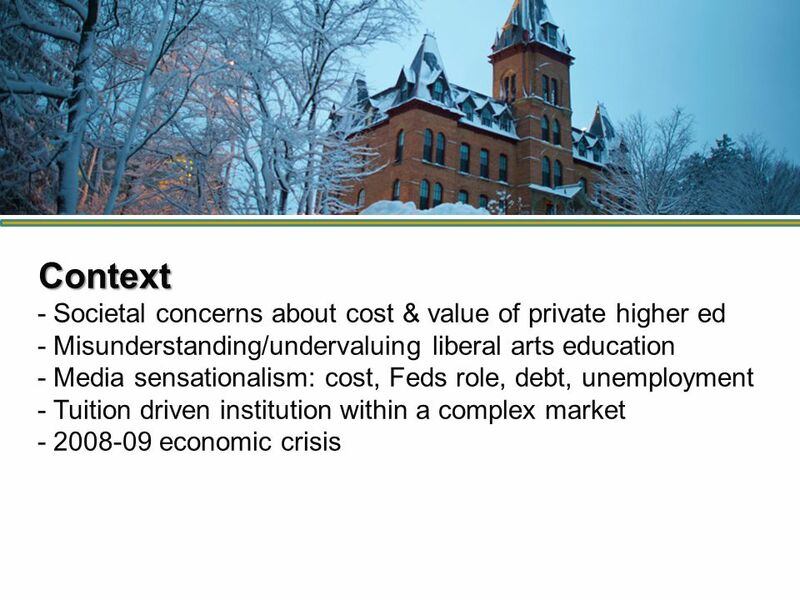 Higher Education Cost and Financial Aid: Unraveling the Pieces Larry Warder Acting Chief Operating Officer Federal Student Aid. Parent’s Course in Career Planning Presented by Career Services Biola University. The Undergraduate Plan Initiatives in Undergraduate Education Prabhat Hajela Vice Provost & Dean of UG Education. Step Into Your Future: Understanding College Fit. 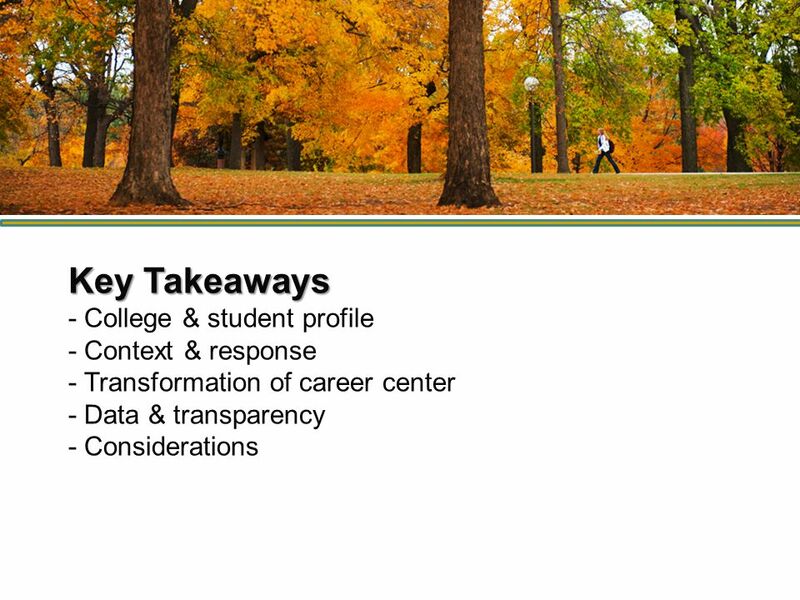 Providing Access to Higher Education: The University of California Experience UC Counselor Conferences September 2014. 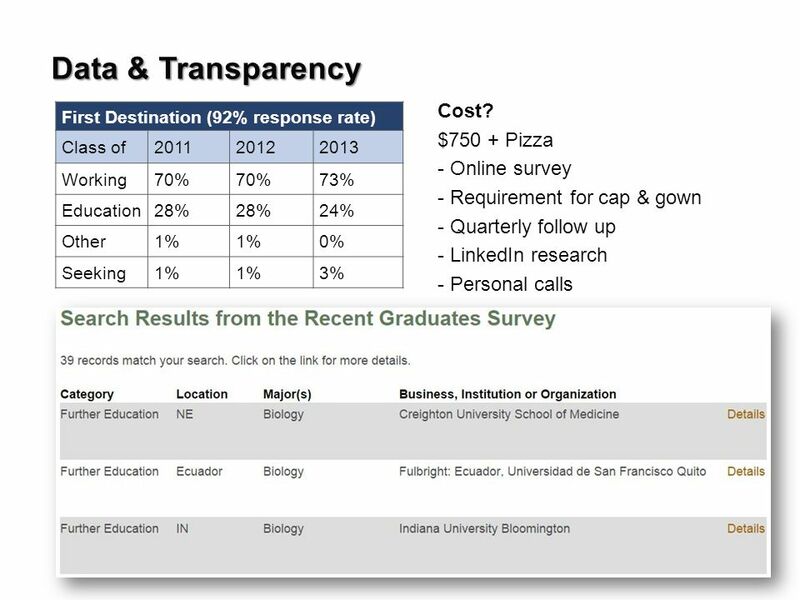 VOCATION AS CALLING: THE ROLE OF GENDER IN VOCATIONAL DISCERNMENT AND ACTION AMONG FIRST-YEAR COLLEGE STUDENTS Cindy Miller-Perrin Don Thompson Research.